You are sitting in the break room, cafeteria or a common area at work, your personalized cup of coffee with stevia and cream in hand, waiting. You know that one person will be back today with another stunning vacation story and unbelievable photos. They never fail to deliver an amazing narrative of an over the top adventure. We are jealous of them, envy them, and want to go with them on the next trip! They usually bring back fun and interesting tokens to hand out: chocolates from Belgium, Kona coffee from the Big Island, a colorful silk scarf from Morocco, a crocheted bookmark from Venice, a cartouche with your name in hieroglyphics from Egypt. Hubby and I discovered an easy way to make our trips more interesting, memorable, and entertaining. 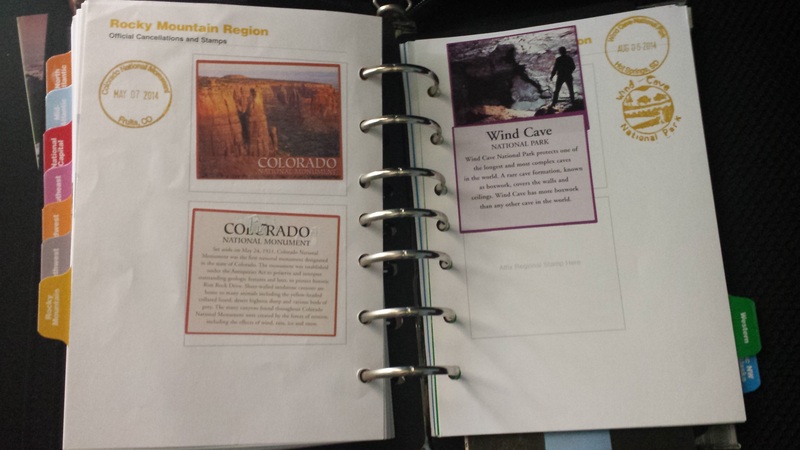 We use our Passport to the National Parks to find never discovered or our “long to visit” locations. If you have never heard of it I’m gonna give you the 411. 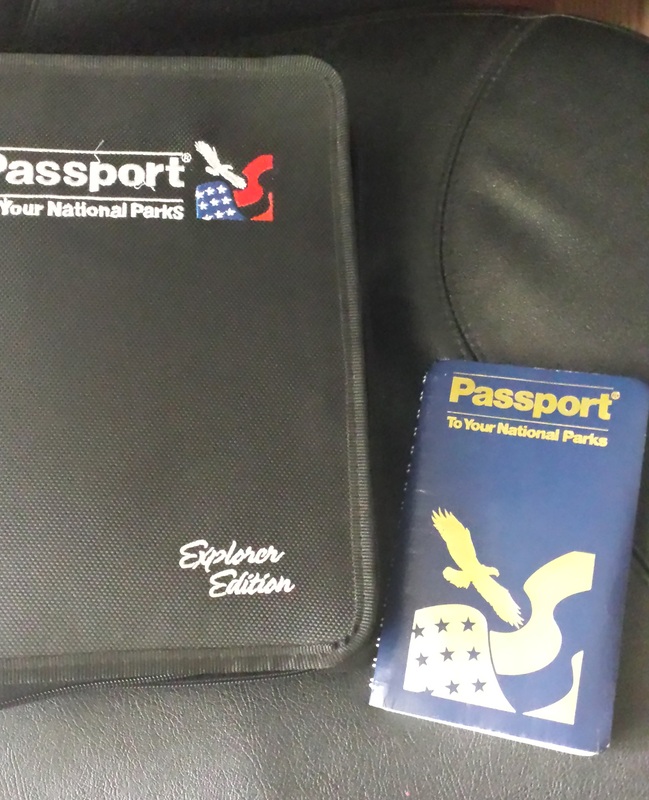 We started our Passport journey with the small book on the right. Once the adventures started, we filled so many pages completely, we upgraded to the binder on the left. Inside are guides to the wonderful, informative, and historic locations in our great nation. At each of these locations is a place where you can get your book stamped with the date and place, just like a travel passport! Also at these locations you can purchase beautifully made stickers for the location you visited. Hubby and I check the Passport when we plan a trip, to see what is along the route and in the area of our destination. This enhances our trips. Another thing that hubby loves are collectible pins which you can be purchased. You learn history and geography as you meet others while visiting these fantastic locales. These are great wedding and baby shower gifts too. We helped start several friends on their Passport journeys this way. You can purchase the books at gift shops and visitor centers at the various locations. On one trip hubby and I made to Chiricahua National Forest, we had just pulled into the visitor center parking lot, when out of another car two boys jumped and raced each other to the stamp kiosk, excited to get their books stamped. Another time we visited Niobrara National Scenic River in Nebraska, a place we had never heard of and would have not found without our books. It had been months since someone had been to the visitor center, so they had to change the date on the stamp, and re-ink the pad. The link below will take you to a page with lots of information and descriptions so you can start your adventure. Posted on 15/01/2019 by Nancy VPosted in blogging, hubby, Humans, travelTagged adventure, baby gifts, collectible patches, collectible pins, National Parks, passport, photos, stamps sets, travel, wedding gifts. Next Next post: Really? A Winery Here?